Home CollaborationBIM Collaboration	BIM Collaboration Across the Pond, LIVE! Have you considered working with another firm to tackle a challenging project? You are not alone. Everyone collaborates, especially big design firms. Whether teaming up with a local architect to better understand site context or a specialty engineer for domain expertise, design collaboration can take your project further and help you get more done with less time and effort. How do architects put collaboration into practice when working halfway across the globe? To find out, watch a recorded webinar where my colleagues and I perform a live demonstration of design collaboration across 3 different time zones on both sides of the Atlantic. We have a BIM Manager in Denver, Colorado reviewing an area of a shared Revit model with his extended design team: the Principal of the firm remote from Fort Worth, Texas, the Architect in Antwerp, Belgium, and the Architectural Designer in Paris, France. 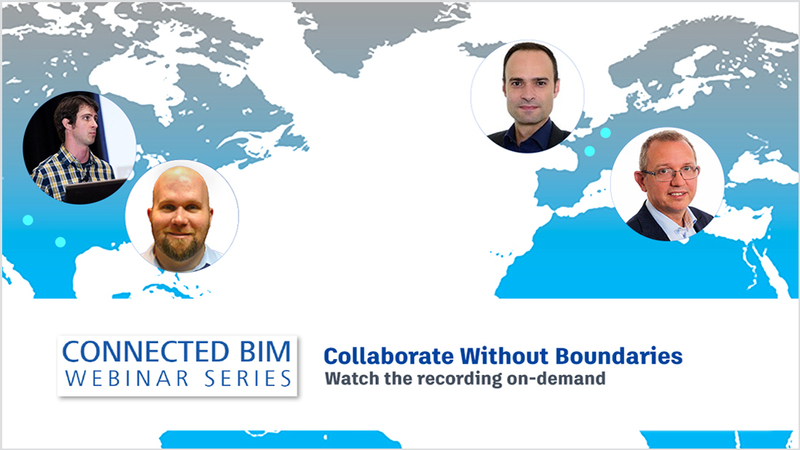 This webinar is a special session that forms part of Autodesk’s Connected BIM webinar series. We guide you through cloud-enabled data sharing and collaboration workflows using BIM 360 Team and Collaboration for Revit. Worksharing: Co-author the same model in Revit in real time. User Controls: Set up projects with appropriate user controls. Version Compare: View changes to the model with each progressive version. Markups: Comment/markup the model with a snapshot of your view of the model at the time of markup. Design review: Host a live design review session that anyone can attend using a web browser. Large Models in a Browser: Search and navigate large 3D Models in your browser from anywhere at any time. This is a fun opportunity to learn how to use design collaboration concepts and technology in your Revit workspace. You’ll see a working session in action across the globe in a workflow that applies to your team even in the same city. We’ll leave time to answer your questions about the process, product, or anything else. “Connected BIM” makes it easier for you to work on building design because it powers your current Revit-based BIM processes with the cloud. It’s all about connecting people, capturing and computing data to provide crucial insights, connecting intent to outcomes, and integrating project delivery. Find out how reality capture, immersive visualization, and collaboration tools will transform and improve your building design process in our ongoing webinar series.